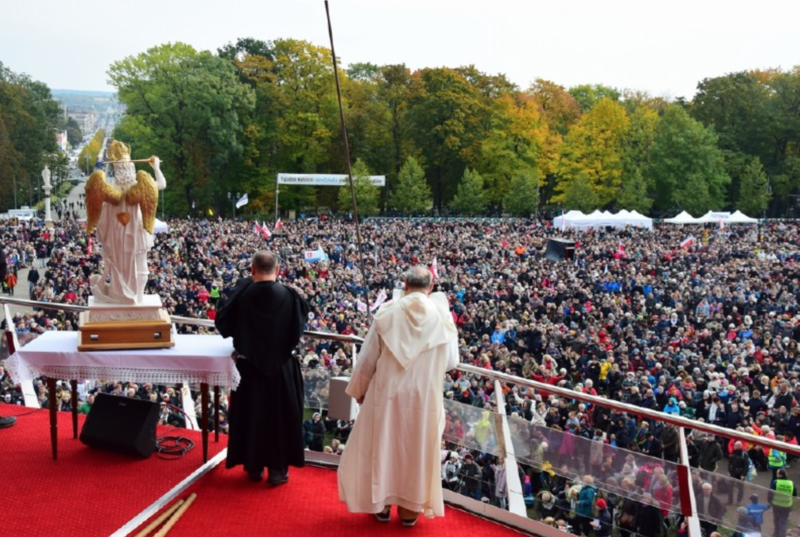 The “Great Atonement” to ask forgiveness for sins and mercy for Poland, was celebrated on Saturday, October 15, at Jasna Góra, with the participation of over 100,000 pilgrims. The program of the day was dedicated to prayer of thanksgiving for what has been accomplished in the history of Poland, with a penitential part including testimonies, a time for Eucharistic adoration, and Holy Mass. The event was presided by Archbishop Stanislaw Gadecki, President of the Polish Bishops’ Conference. Many of the participants received the sacrament of penance and expressed a great sense of common prayer. – “We want to show that Mary is the resort for Poland and for the world and, with her, we can do everything. Many times in the history of Poland prayer has been necessary, and that is the case today,” said one of the pilgrims. The “Great Atonement,” was for both personal sins and for those of the nation, including in particular for the murder of unborn children, addictions, jealousies and divisions. The lectures and prayers were led by the FF. Antonello Cadeddu and Henrique Porcu, both missionaries from Brazil, Superiors of the Covenant of Mercy Community, and Fr. Piotr Glas, exorcist. “I think everyone here can get something for himself, finding himself through spiritual atonement, under the guidance of the Holy Spirit,” said Fr. Dominik Chmielewski, SDB. The event was divided into three parts. It started with thanksgiving to the Creator for all the good that has been accomplished in the history of Poland. In the afternoon, Holy Mass was celebrated and Archbishop Stanislaw Gadecki, President of the Polish Bishops’ Conference, gave the homily. In this homily, he stressed the need to return to God’s people and communities, like the prodigal son. Then, in the evening, devoted to repentance, the assembly asked God’s forgiveness for personal and social sins. The Great Atonement is the initiative of laity, in collaboration with the clergy. According to the organizers, this meeting was a profession of faith and the convinced affirmation that renewal is possible in God and with Mary.